For Halloween, and the final story in the Gutteral Screams series, Chris McGinley spins a gothic tale about the unknown. And how you may be better off leaving it that way. "What happened on that day so many years ago, Goody Wells? Unburden yourself before the Lord God, and you shall be purified, woman." The Prior was not above a lie, if it served God. The truth? He wanted Goody to burn in the infernal lake. But he needed a confession. Goody sat across from him, on a plain wooden chair in the sanctuary of the small church. "Goody Wells, something happened in that corn field. I will know it. God will know it. Tell me!" Goody only bowed her head. "We are old, woman, near death's door. Too long has this plagued us. It is not only your soul that suffers. I, too, must know what happened. You took a child into that field, Goody. You were watched. It was the Wilson boy, from Weymouth Village, a child never seen again. His parents still weep today." Goody suffered these interviews with the Prior, always on the anniversary of the Wilson boy's disappearance, and at times throughout the seasons. How could she not? The Prior was law in the little Puritan village. He would not relent. He would know what happened. For over thirty years he had pursued the boy’s disappearance. The Prior decided to try her given name. "Mary Wells, you walked into the cornfield with the boy. The high stalks shook and a sound was heard, a deep sound. Mr. Richards and his wife witnessed it. They saw a woman from atop the hill where their home then stood. It was you. Was it not?" Goody looked the Prior in the eye, her long grey hair matted and tangled, her face a map of wrinkles and liver spots. "Prior, I did no harm to any boy. This I have told you many times. I'm a simple woman. Leave off this matter now. As you say, we are old. Let us live our remaining days in peace. The Richards are known to bend the truth. This you know as well as I." She lifted her hands in supplication, but the Prior thought he saw her tremble. Was she weakening? He slid his chair close to her, leaning in so that his face almost touched hers. "I will know who you are, Goody Wells,” he hissed. “God will know. Now tell me what happened on that grey day so many years ago. It was a chilly day, but the boy wore only a nightshirt. He must have been cold. Think of the poor boy, Goody. Think of his parents. Give them peace, and tell me why the stalks shook." Goody's eyes grew red. Was she about to cry? Would she confess? But though her eyes reddened, no tears came. She spoke finally, urgently. "Prior, I tell you one last time, I have done no harm. Now leave me be. I beg you." Her hands locked on to the Prior's wrists. The mottled skin and bony protrusions unnerved him. Her hands were wet and cold. Why was she so importunate now? He must soldier on, he thought. It was God's work through him. She was on the verge of revealing her sin. "I must hear it from you, so that you may be cleansed before God. What happened among the corn stalks?" "I did not harm the boy... nor was he cold, Prior." The Prior's heart raced and he had to restrain himself. He had her now. "Goody, it is righteous that you admit to taking the boy. He must have felt your kindness. There must have been a trust between you." Candlelight played on the stone walls of the little church, and the Prior noticed that ice had begun to form in stalactites there. He saw agonized, elongated faces in them...and something else, too. The Gulo. Its name came from the Latin for gluttony, a fact the church scholar knew well, but he knew it came not from any proper taxonomy. The Gulo was the kind of thing the Prior railed against in his fierce sermons--a pagan beast, the invention of provincial minds. 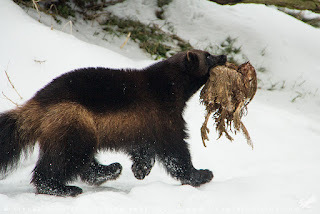 Children secretly said it was a sort of wolverine but with a flattened snout, rows of uneven canines, and coarse black hairs like Indian bone needles. The story went that when it came, from far, far north, it demanded a sacrifice. In return it provided good harvests. The Prior didn’t trust his eyes, but his fingers began to burn from the cold. "Now tell me, Goody Wells, what did you do to the boy?" he asked as he rubbed his hands together. "You cannot? Or you will not?" Goody closed her eyes and breathed deeply. Her chest swelled. "I cannot tell you, Prior, because it is beyond words, beyond your understanding. I tell you plainly, do not ask me again, for I may not give you the answer you seek." Goody struggled visibly in the little wood chair, as if resisting something inside her. Finally she whispered, "I cannot tell you, as I said, but you shall know it all now." She opened her eyes, the pupils fully dilated so that only a thin ring of white encircled them. The sanctuary grew colder and the Prior could see his own breath. On the walls, the stalactites grew to become wide sheets of ice, dripping with water, and thickening so that the room seemed to become smaller by the second. And there the Prior saw it. Goody and the boy amongst the stalks. But there was something else there. A squat, black figure with thick limbs and muscles that showed through its spiny hide. The Gulo. It reared back and forth, low to the ground, and made a guttural, feral sound. The Prior saw Goody remove the boy's nightshirt. The low, black creature raised its head and sniffed the air. It let out a high keening sound just before it lunged. Then, after all these years, the Prior finally knew what he wanted to know. Though now he didn't want to know it. An involuntary, sharp intake of breath followed. His throat seized, chill with ice water, and his eyes widened with a terrible knowledge. Before he collapsed, he saw the endless shocks of corn that filled the fields some thirty years ago, a vista in his mind's eye. Row after row of neatly bound shocks. After many unfruitful years, it was the greatest harvest the community had ever produced. He saw it again now, for the last time. Chris McGinley teaches middle school in Lexington, KY, and has forthcoming stories in Near to the Knuckle and Yellow Mama in addition to his three stories published at Out of the Gutter.